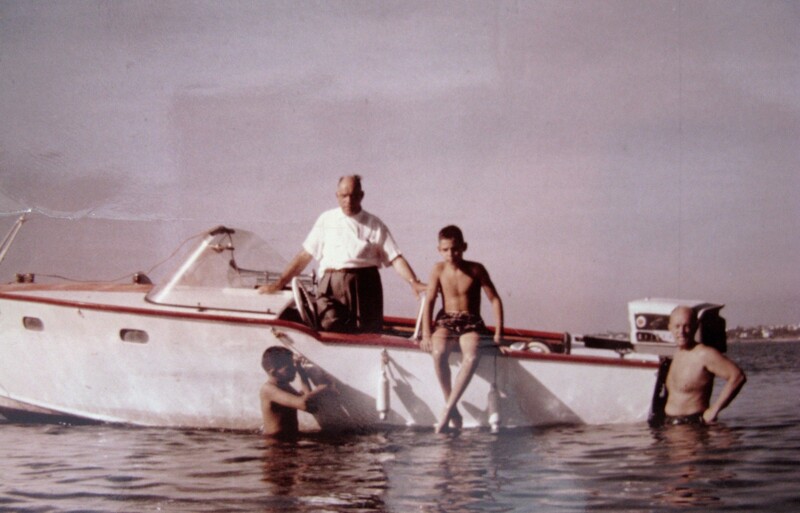 The Emmanuel Riginos Family boats & their storytelling: I am Byron (a.k.a. Beracuda), younger brother of Vasilis (a.k.a. Istioploos) and Nikos. 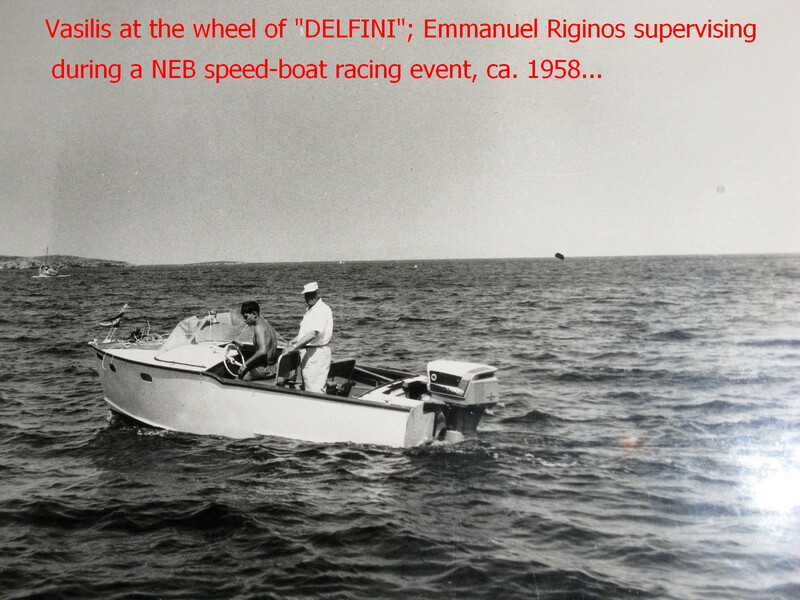 The first Emmanuel Riginos family boat, a custom built motor sailer. Here at the Perama boatyard slip, a sail fitter is making final Jib adjustments while another sail-maker is trimming the sun awning in the cockpit. 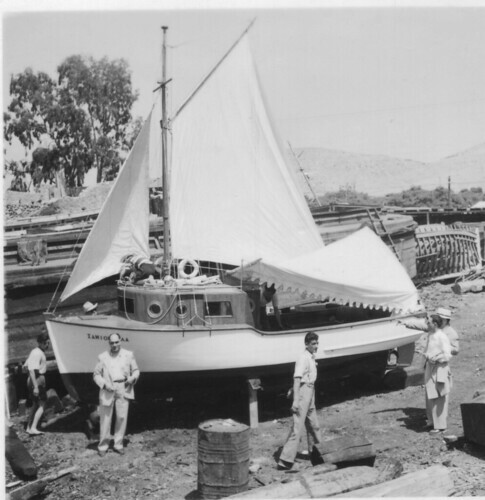 On left, in front of the “SAMIOPOULA” boat name is the proud owner, Emmanuel Riginos, while his brother George is at the stern (jacket in arm). Ca. May 1950. 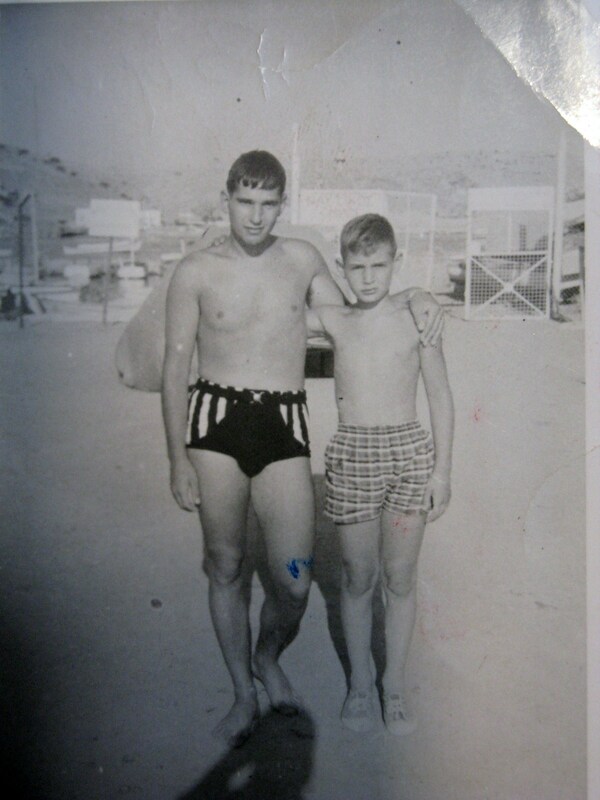 Like my brothers, we grew-up in a family of sea and boat lovers (both our parents originating from the island o Samos). During the Greek War of Independence (1821), Samos played a conspicuous part, setting up a revolutionary government; in 1835, the Samians achieved self-government as a semi-independent state tributary to Ottoman Turkey. 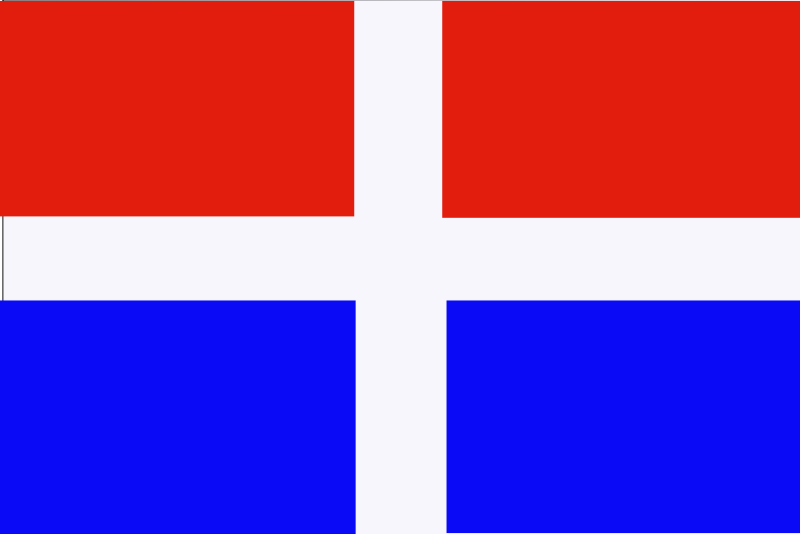 The Principality of Samos (Hegemony) was governed by a Christian of Greek descent though nominated by the Porte, who bore the title of “Prince”. Family legend has it that our Great Grand Mother’s family, from our mother’s side, named Tremoulis [fearsome, tremor inducing], and uncles Veinoglou were running a cargo and trading business with sail powered vessels; as privateers they might have engaged in occasional “light” corsairing operations perhaps under Letters of Marque from the Prince during the 19th century, being active in the Mediterranean Sea. (For a historic presentation of Samos from ancient to modern times, in English & Greek language click here). Our uncle (from mother side) Costas Iliades, as a young graduate doctor had served in the Greek Army against the invasion of Italy in 1940. Escaping the occupation by various means he reached Alexandria, Egypt, where was the naval base of the East Med allied fleet, and where several Royal Greek Navy ships had fled and joined. 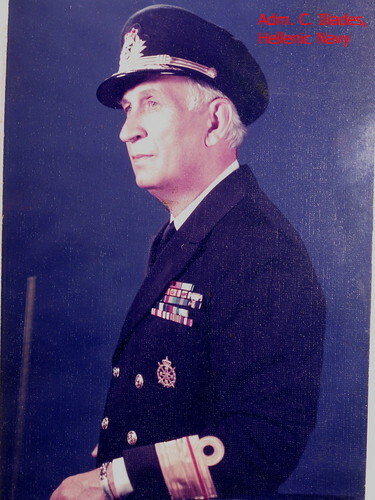 He soon after volunteered as an Ensign (M.D.) in the RGN during the 2nd WW. A boat lover himself, later in life he rose to the rank of Honorary Rear Admiral in BOTH the US Navy and the Hellenic Navy! Uncle Costas who after the war went to the USA for post graduate training in ENT medicine… got married and lived there with a distinguished career, was visiting Greece almost every summer, staying with us in Voula. 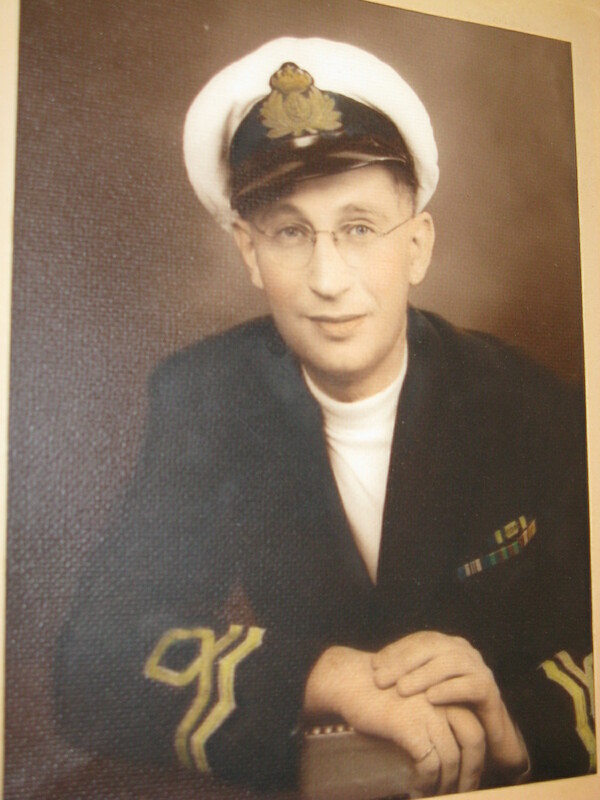 We would often prompt our favorite uncle to story-telling for us many sea adventures from his navy war years! All along as youngsters we spent our early and teen years by the sea, in a suburb of Athens named Voula. 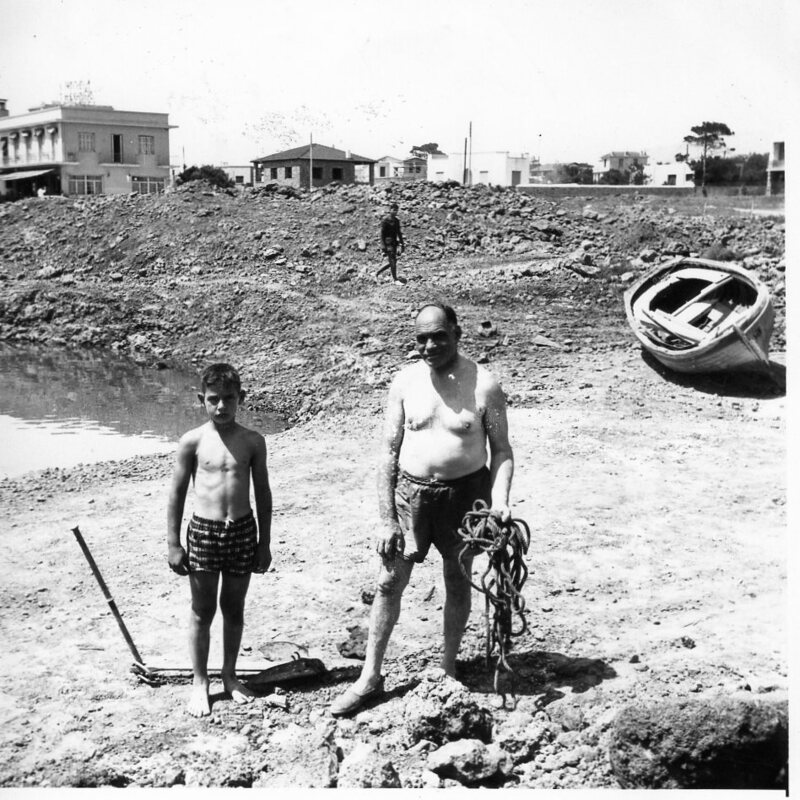 There our dad, Emmanuel along with a bunch of friends who all owned small boats and liked to go fishing, set up the Nautical Club of Voula (then NEB now NAOB) in the early fifties. Byron & father Emmanuel at the NEB grounds during construction days of the inner harbor ca. 1959. The legendary “Hotel Monte Carlo” in the background! In the ensuing years, NEB became the focus of our activities including sea sports, social life etc. In one of such memorable social events, the Club had organized a reception to honor Savvas Georgiou, who in 1956 had crossed the Atlantic with HARA, a small 8.5 m. engineless sail boat, accompanied by his (non-sailing at the time) young American sweetheart and wife to be Sue. The feat of this crossing (no GPS, VHF, Navtex, Radar, auto pilot etc at those times), inspired many Greek youths to take up sailing. One of them was older brother Vasili, who later in life lived this very dream of his, about crossing the Atlantic under sails during 2005. 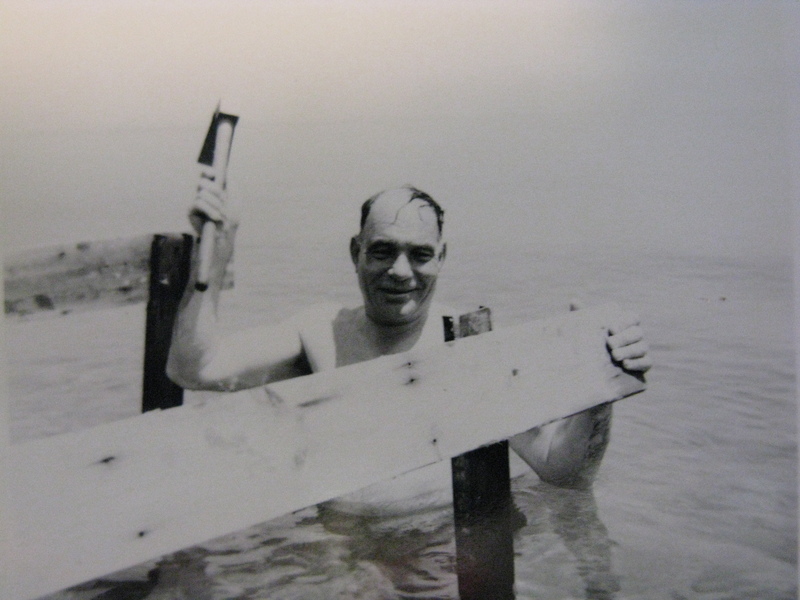 Emmanuel Riginos constructing a pier for the NEB in “Kokkinos Vrachos” (red rock) in Voula, ca. 1950. Like father like son, I am now involved in setting-up the Nautical Athletic Club of Kea – NAOK (unfortunately this site is currently available only in Greek language, but included are some nice photographs worth looking-up). The island of Kea is our second home, where we spend many happy days of the year. It is also where my boat’s anchorage is (in Koundouros Bay). 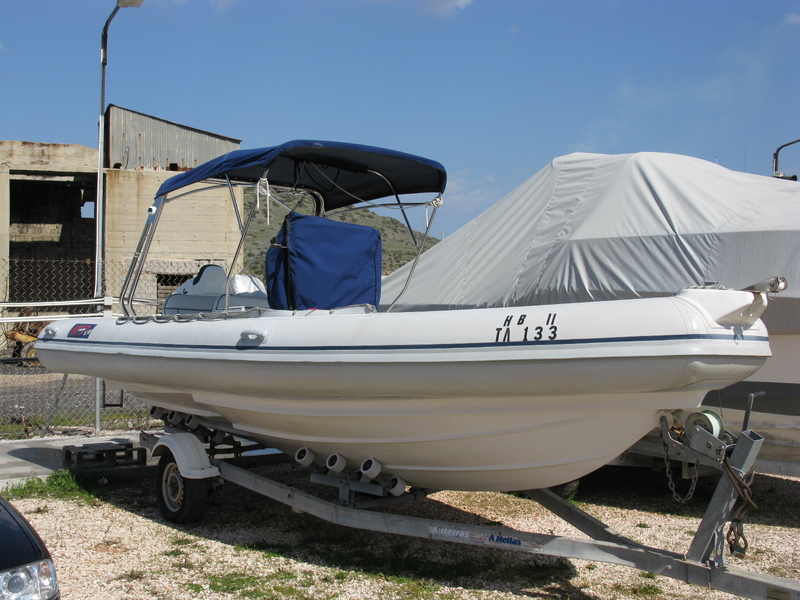 Currently (primarily because of the island home), I own a 28′ RIB named after my wife, “HBH III”, which is also used to commute fast from the island to the port of Lavrion on the mainland Athens metropolitan area. 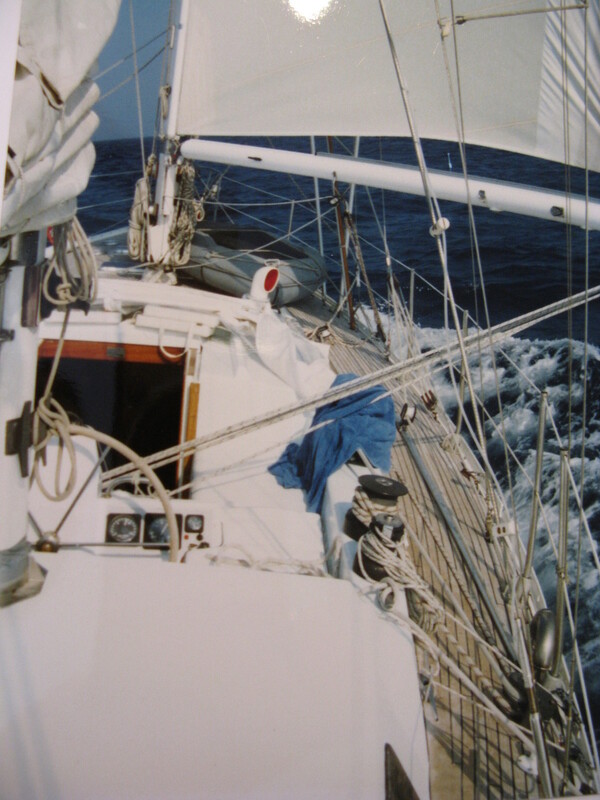 In previous years we owned “S/Y SUNNY” a beautiful Italian built 50 footer ketch (Cantieri Costaguta) with which we sailed happily for some years in the Greek seas. Vasilis & Byron at the Vouliagmeni Nautical Athletic Club ca. 1958. Here swimming and water skiing races were held. 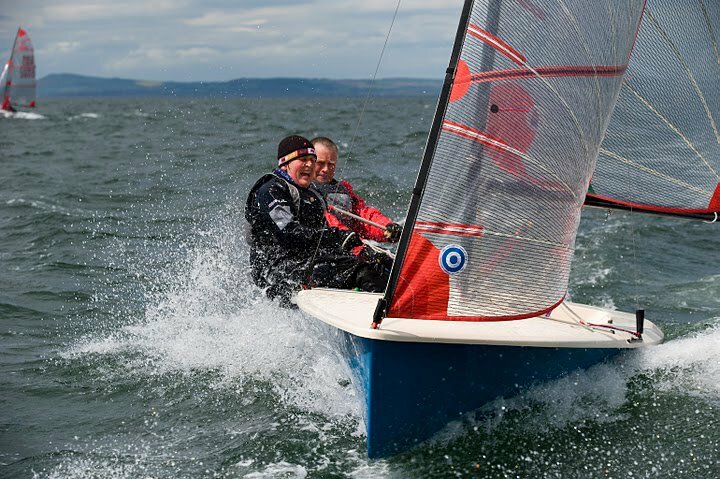 My current sailing activity is purely for fun with the exciting Tasar which is a 4.5 m. high performance sailing dinghy, designed to be sailed and raced by a man and a woman (Alas! I have not found such one as yet…). A light weight, low drag, planing hull, a rotating mast, featuring a roller jib and fully battened mainsail, with efficient sail controls, she provides exhilarating sailing without the need for spinnaker or trapeze. I am grateful to my brother Vasili who gave me this little fun craft as a gift some years ago! Byron & niece Cynthia on the Tasar in Samos ca. summer 1998. SAMIOPOULA was launched on 27th May 1950. 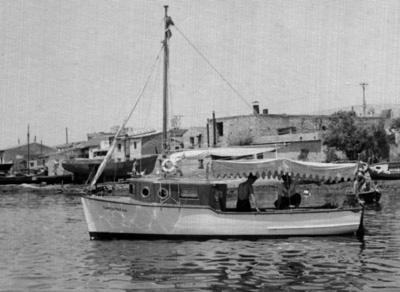 She was the first Emmanuel Riginos family boat. Hence a Boat lover since…infancy. 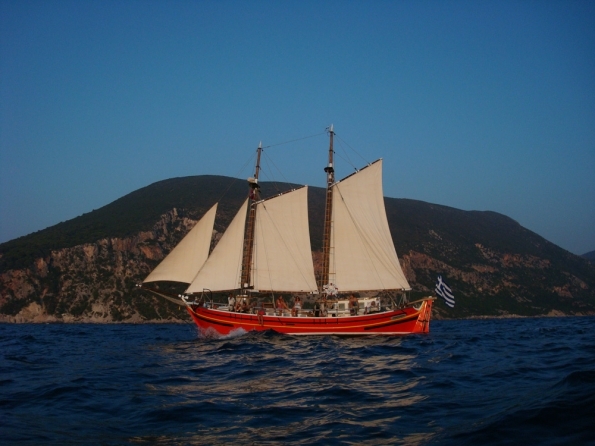 Ever since our father got his first boat in 1950, the venerable Samiopoula, a boat constructed like a Greek caïque but in the shape of a motor cruiser and with sails. 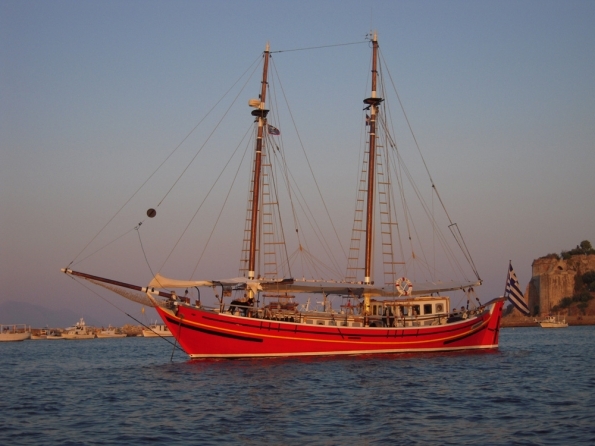 Family legend has it that my mom’s labor time for me commenced on board the Samiopoula! 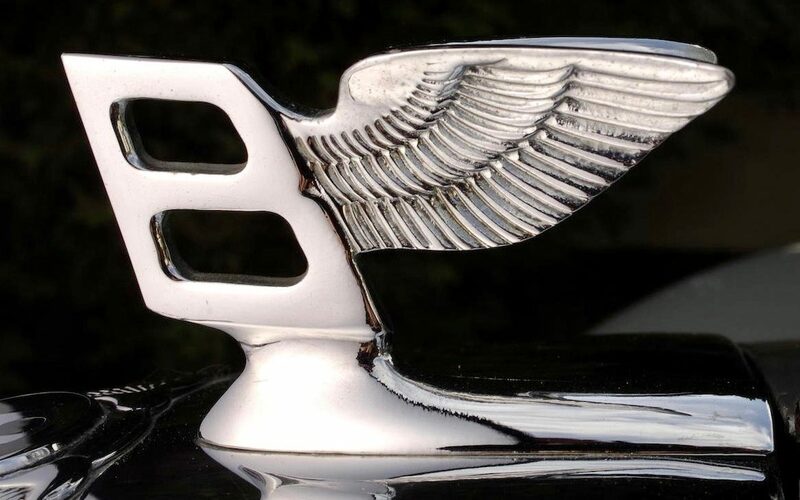 I still recall her distinctive smells and the noise of her capricious Graymarine gasoline engine. This family vessel was our first introduction to boating. Our father loved to go fishing and always insisted on taking one of his three lads with him as his crew. From him and his fishing friends we learned the ways of the sea and how to respect her. Our love for the sea during our youths had no bounds. We sought out fishermen who were still using sails, and spent many hours listening to their fantastic stories. 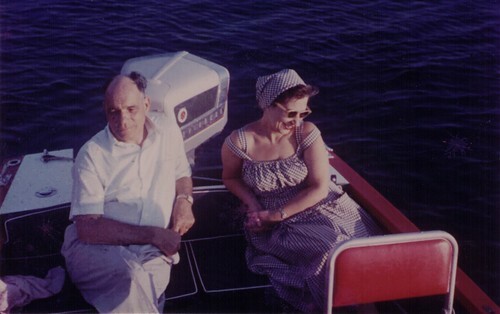 In the late 1950’s our father sold Samiopoula and got a 16′ speed boat made by Chris-Craft and named her “DELFINI”, plus a small fishing boat named “BYRON”, both powered by outboard engines. DELFINI, a 16 ft. Chris-Craft made of marine plywood. 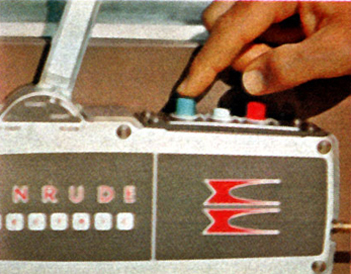 Here powered by the legendary Evinrude 50 hp “Selectric shift”. A complicated outboard motor breaking down often. This speed boat was originally equipped with two 18 hp outboard Evinrude engines, then upgraded by a single 50 hp featuring the revolutionary “selectric shift”, later upgraded once more by yet another single 75 hp, the most powerful outboard of that period, made by Evinrude (our family being the sole distributor of Evinrude Outboard Motor Corp. for some decades in Greece). As a teenager I was of course thrilled by the speed and loved water skiing. 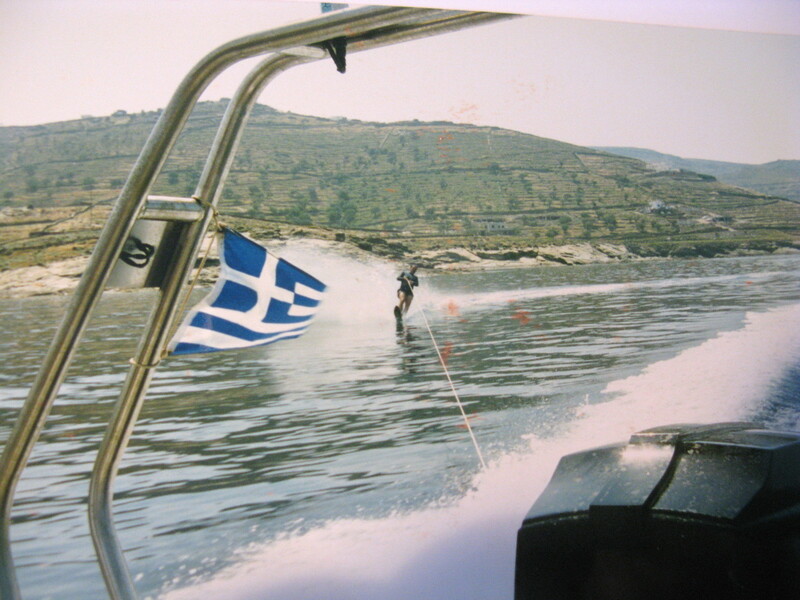 This sport, a novelty in Greece at the time, was taught to us by our older brother Vasilis. Our Dad with Nikos and Byron and a family friend. 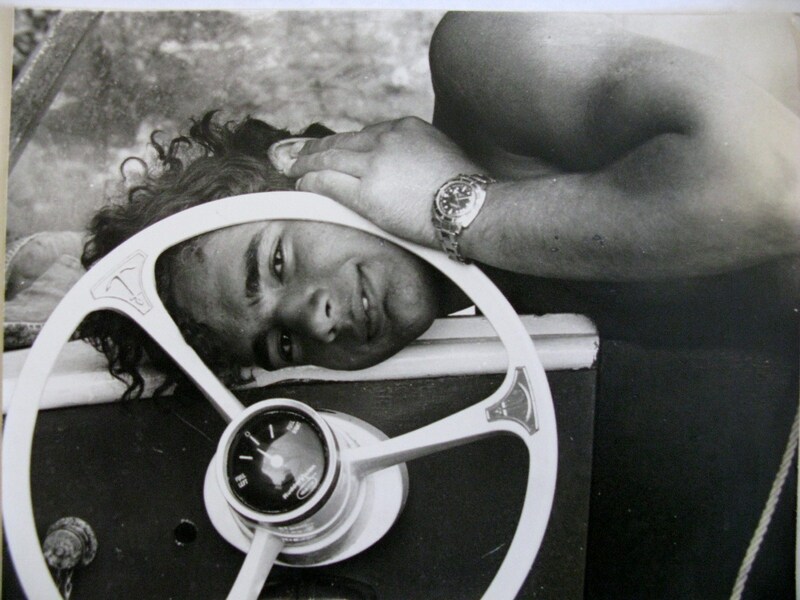 Byron behind the steering of Delfini. This pic taken by an American sweetheart ca. 1967. 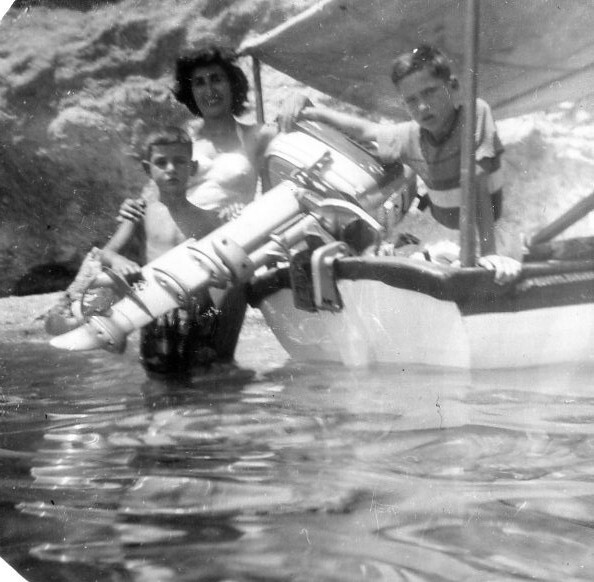 Early seamanship exposure: here in Katramonisi of Voula, Byron with our Nanny and Nikos aboard “BYRON”, ca. summer of 1959. 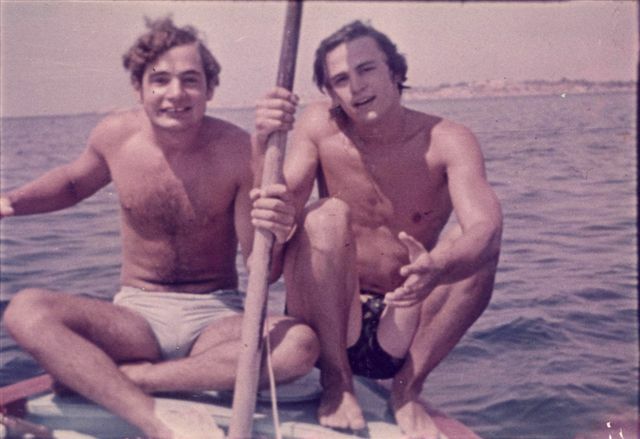 Later, as teenagers with brother Nikos, not being able to afford the fuel for the small fishing wooden boat we had, named “BYRON” (after my grace), powered first by a 3 hp and later by a 5.5 hp Evinrude outboard, we converted her to a square rigged sailboat, using her tent as a sail and the tent poles as masts. By this primitive but memorable way, we first learned how to sail. 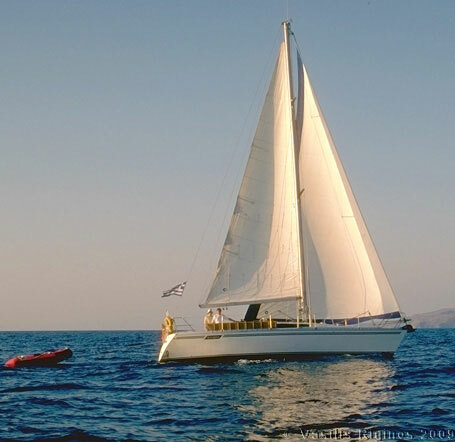 Needless to say, that “BYRON” became the center of our sea going activities for a number of years, around the NEB yachting club,venturing often to the one mile away Katramonissi (a.k.a. Ydroussa) with friends and their parents small boats. 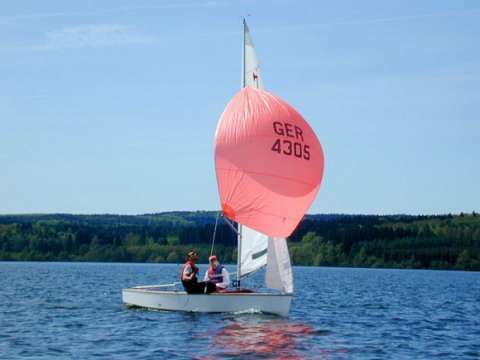 The Pirate, a German dinghy design of 5 m. length. Traditional Perama style caique “FANEROMENI”, rescued and preserved in a life-time effort by our brother Nikos E. Riginos. Brother Nikos owns a traditional Greek ‘Perama’ caique, the distinctive and lovely “FANEROMENI“. Built in 1945 in the island of Skiathos, she was used for many decades as a cargo carrying boat in service between many Aegean islands. Before Nikos bought her, she was carrying tourists for day outings in the area of Poros island. For this special boat a separate chapter or even an entire book is needed to describe and document her, requiring many pages for such a task. Answering this need, Nikos has created (June 2009) an amazing web site (also in English language) http://www.faneromeni.gr/en/ offering homage to his life-time mistress! The “FANEROMENI” has been featured in a number of sailing and boating magazines, while the architect Kostas Damianidis who specializes in traditional boats, has drawn detailed plans of the vessel. In addition, Nikos has commissioned an artist for an oil painting, albeit rendered at an earlier period when the caique was painted blue. 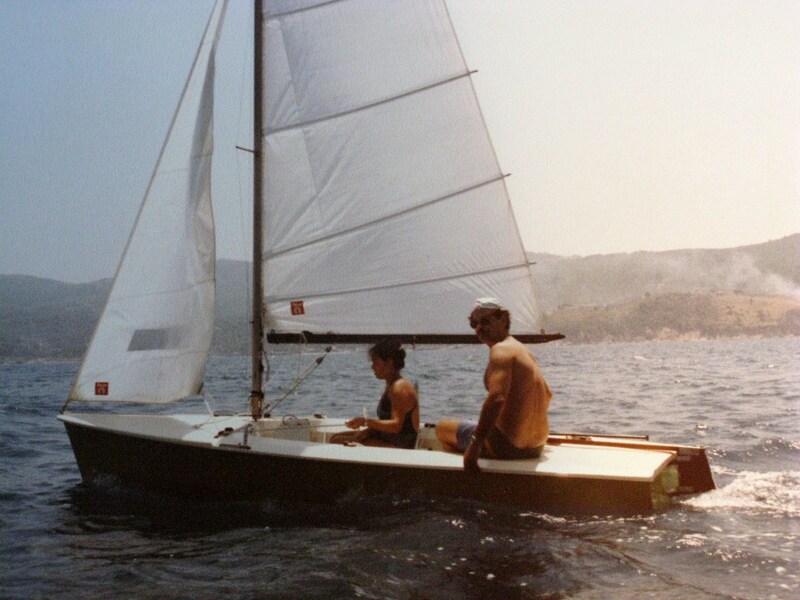 Aside from the sailing dingies and the family boats of our father, my first partial boat ownership (1/3) was with S/Y “SUNNY”, a classic lines 50 ft. ketch co-owned with my pal’s Spilio & Athanase. The model name was Koala, built by the Italian boat yard Cantieri Navali di Costaguta. This strong hulled sailing boat offered to us many happy and smiling days at sea and I will always reminisce her fondly. “S/Y Sunny” a Koala 50 feet ketch built by the Italian Cantieri Navali di Costaguta. 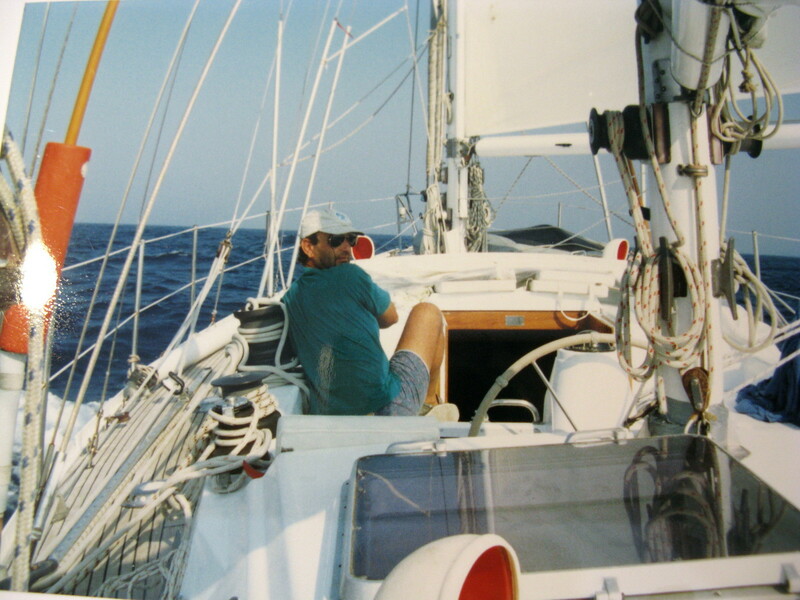 “S/Y Sunny” offered to us many sunny days, sailing both on the Aegian and Ionian Seas. Co-owner Spilio looks back as the obedient autopilot “Sklavos” (the slave) maintains us on course. 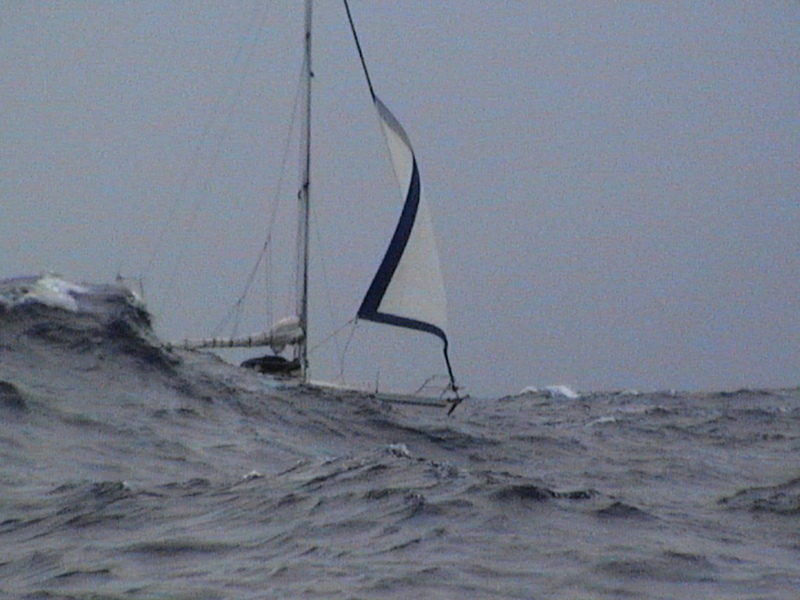 “S/Y Sunny” under way. 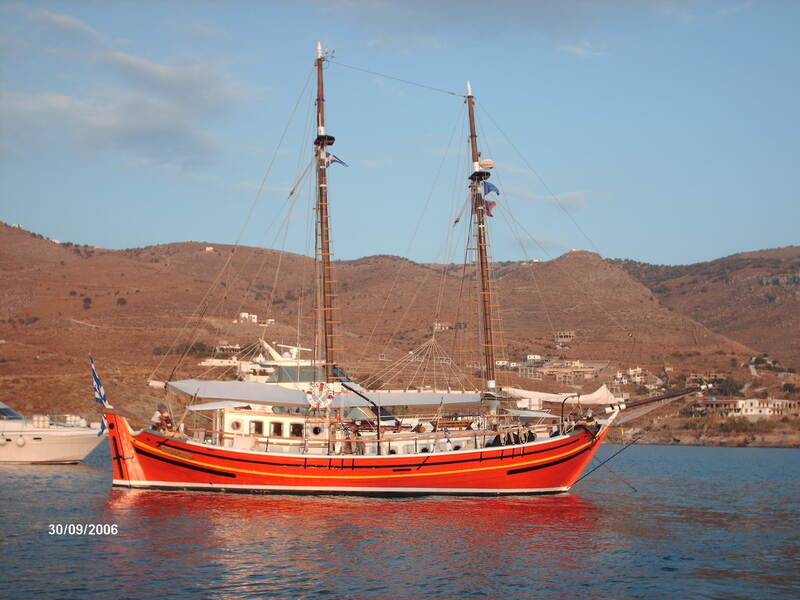 She was a strong and beautiful hull, once sailed confidently under Force 11 conditions in the Aegean! After selling “Sunny” trough an unexpected “an offer you can’t refuse” situation at a generous price, all three of us invested the capital in pieces of land in Katevati, Kea, where a bunch of five friends built our island homes. At that time, while the building construction was going on, we needed a fast boat to ferry us all back and forth from Lavrion. Hence we ended-up owning a 38 Ft. Magnum cruiser boat, named “KALLISTO” shared this time by four friends, our neighbor Nikos taking-up the fourth share. 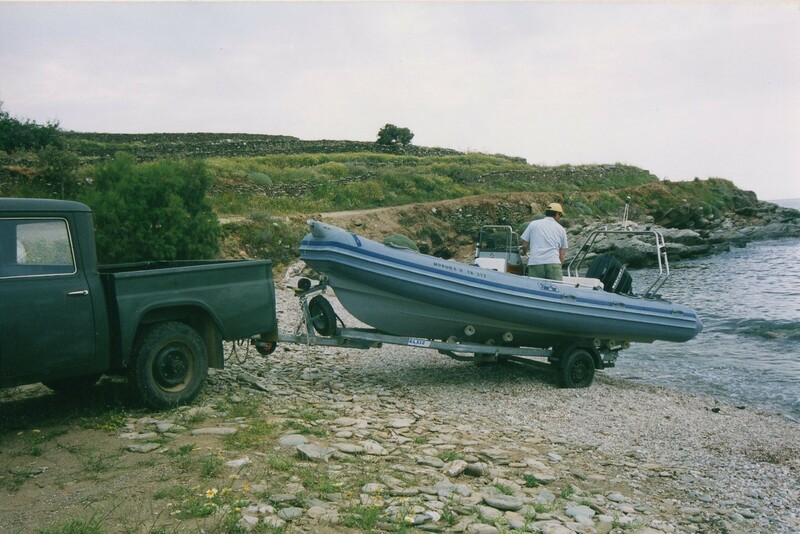 Soon after the island houses were finished, I bought my first Rigid Inflatable Boat-RIB, a 5.80 m. Italian made Joker Clubman Boat, powered by a single Mercury 115 hp twin stroke, named “MORUDA II”. 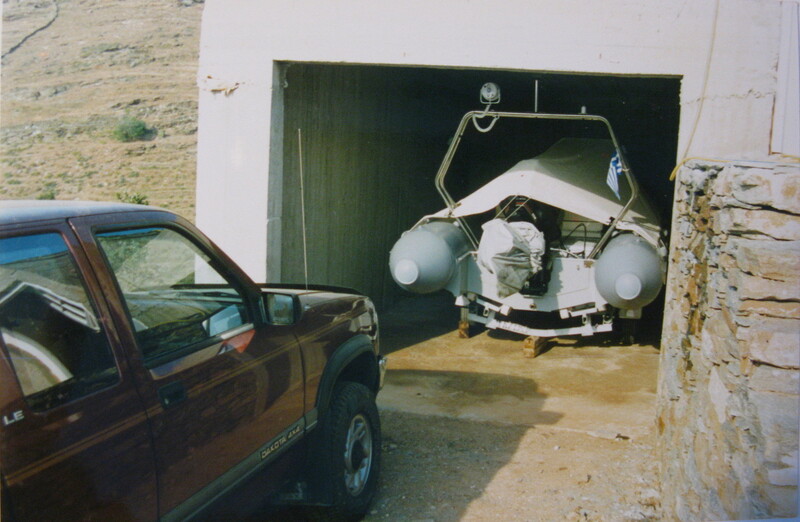 I kept this boat on the trailer and stored it in the garage at home in Kea. Although launching her each week-end was very exhausting while driving up and down the narrow, hilly, rough dirt roads to KATEVATI, was quite treacherous (especially so during the early years, before the opening of “Route 66”). “MORUDA II” a Joker Clubman RIB of 5.80 m. length ready to launch in Koundouros, Kea. 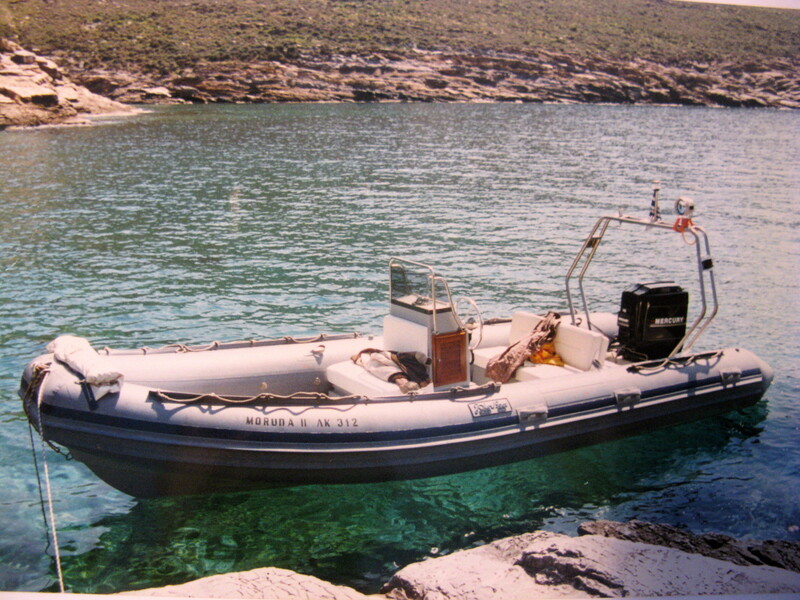 “MORUDA II” was a fun easy to handle RIB that offered to us many nice outings exploring the island of Kea were she was based. “MORUDA II” was often used as a ski boat. Here Byron slaloming, water-ski being a since childhood learned sea sport. M-II at the Garage in Katevati (pre-R-66 days). After some years, in 2003, I bought my second, new RIB, an X-Trim 665, i.e. 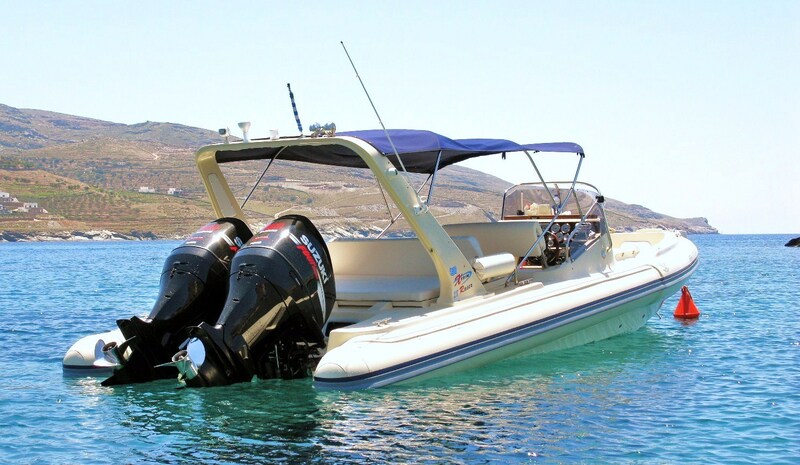 a 6.5 meter powered by a four-stroke Johnson 140 hp, plus fitted with a 9.9 hp auxiliary Johnson two-stroke. We named her “HBH II”. Enjoyed commuting regularly from 2003-07 to our Kea island home, from the Lavrion port where the boat was kept during the winter months and working weeks. 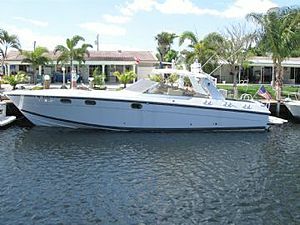 X-Trim 665, “HBH II”, featuring a twin stepped hull. In the spring of 2008, I traded-up from the 665 X-Trim to the twin engined 28” Racer. 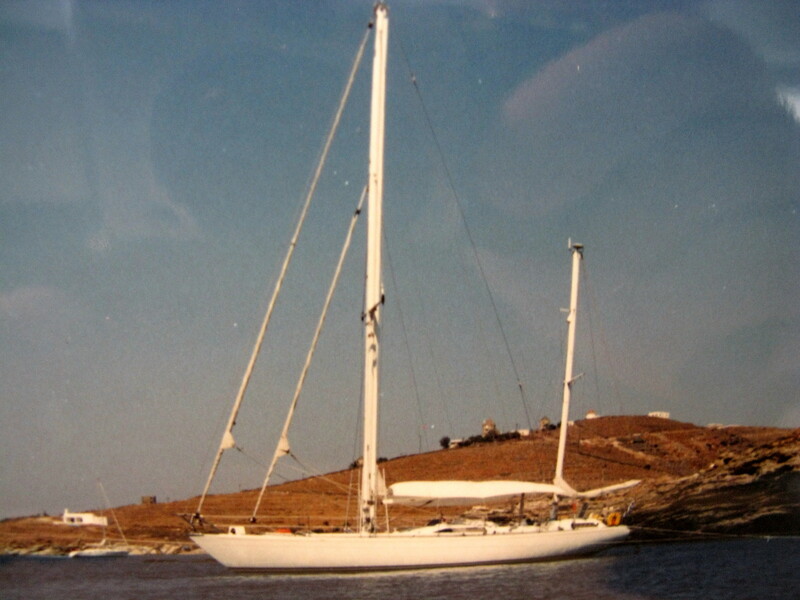 HBH III at her anchorage in Koundouros Bay, Kea Island, Greece. Other Boating and Sea related interests include shipwreck diving (for more look here: for the 2009 S/S Burdigala Project http://www.keadive.gr and for the 2008 Kea Dive Expedition http://keaexpedition2008.wordpress.com), water skiing, underwater photography, marine ecosystem preservation etc. Dolphin Stampede: amazing number of dolphins dancing together! Part I of the Kea Dive Expedition Sep. 2008 video. Part II of the Kea Dive Expedition Sep. 2008 video. An introduction to the HMHS Britannic (Titanic’s sistership) world famous shipwreck. A/ Ocean explorer Robert Ballard takes us on a mindbending trip to hidden worlds underwater, where he and other researchers are finding unexpected life, resources, even new mountains. He makes a case for serious exploration and mapping. Google Ocean, anyone? On more than 120 deep-sea expeditions, Robert Ballard has made many major natural discoveries, such as the deep-sea vents. 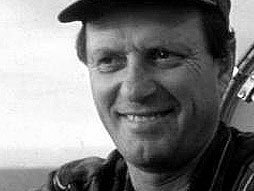 From an early age, Robert Ballard was intrigued by the deep. He’s perhaps best-known for his work in underwater archaeology; in addition to Titanic, he has found the wrecks of the Bismarck, the USS Yorktown, the nuclear sub Thresher (on a top-secret mission for the Navy — for which the Titanic was his cover story) and John F. Kennedy’s PT-109. Click here for his full bio on TED and more links. For his exciting presentation click here: Exploring the oceans! B/Then make sure to also watch Dr. Sylvia Earle’s presentation! 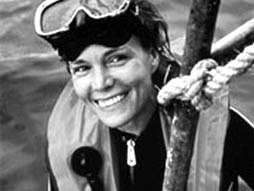 Sylvia Earle has been at the frontier of deep ocean exploration for four decades. She’s led more than 50 undersea expeditions, and she’s been an equally tireless advocate for our oceans and the creatures who live in them. Click for her magnificent, TED Prize winning presentation: Here’s how to protect the blue heart of the planet! I am currently considering the purchase of a 1972 Koala 50 located in the Dominican Republic. I did a google search “Koala 50” and it lead me to your site. Excellent!!!!!! I read the whole site and found it to be very interesting and entertaining. Thank you. The Koala 50 is a very strong ketch. I will never forget getting into a Force 11 situation off the island of Tenos in the Aegean. Boy she could take the beating securely. Hope that you make the deal and the boat offers you much pleasure as ours did. When you do, I would love to share some pictures. All the best from sunny Greece.